the numbercruncher is a modern Xero based cloud accountancy and bookkeeping practice specialising in small to medium businesses and the self-employed turning over from a few thousand to a few million. Numbers are our thing, we connect smart people to smart things in smart ways, we are green and local at heart and always straight talking. 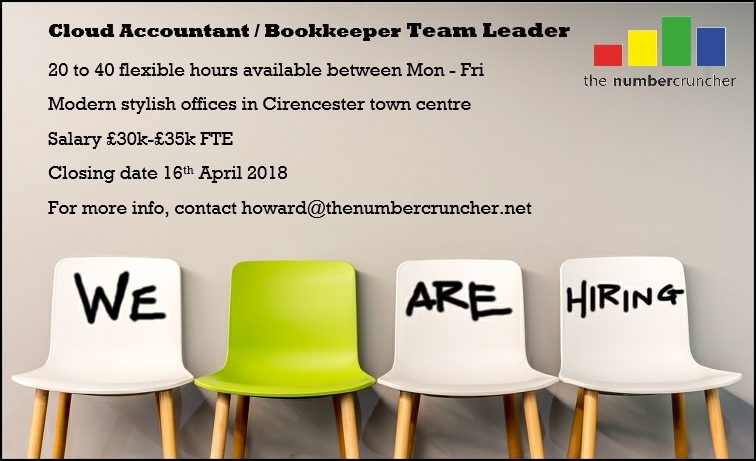 A hands-on, hard working, tech savvy individual with a sense of humour, who is polite, has good communication skills and a sharp attention to detail to become a valued member of our long-term team, working alongside ‘the original numbercruncher’ to fit in with our values and deliver our particular brand of customer service excellence. Have extensive knowledge and experience of performing day-to-day accounting across a wide number of industries. Be able to demonstrate general accounting knowledge in areas of VAT, personal tax, corporate tax and payroll including auto enrolment. Be highly competent with Excel, accounting software such as Xero or Sage, Windows operating system. Have experience of managing challenging clients and have self-confidence in decision-making. Be engaging with clients through telephoning, emailing regularly to assure the customer of our continual and perpetual attention. Have the ability to work on your own initiative and to remain calm with a positive attitude to overcome a challenging workload in an often-pressured environment. Be able to demonstrable evidence of interpreting client communication and understanding their requirements in accounting terms, then delivering what’s needed to the client’s satisfaction. Have a formal accounting qualification. Have experience of managing a teams workload and delegating/allocating tasks to team members. Have confidence to raise concerns with line manager about the ability to meet the demands of the workload. Have experience of monitoring team members capability and delivering mentoring/training/support where needed and managing difficult situations where all intervention fail. A salary of £30,000 to £35,000 (FTE) depending on experience. Workspace in a modern stylish natural office environment in a town centre location with a car park within easy walking distance. Freedom and support from management to be become accredited on our key software platforms Xero and Receipt Bank.